Cook up savory meals and make great memories with family and friends at your custom outdoor kitchen and BBQ. At Innovative Building and Design, our planners and installation professionals will transform your backyard and patio into the outdoor living space of your dreams, with all the amenities that best serve your tastes and lifestyle. After all, as it’s often said, the kitchen is the heart of the home. 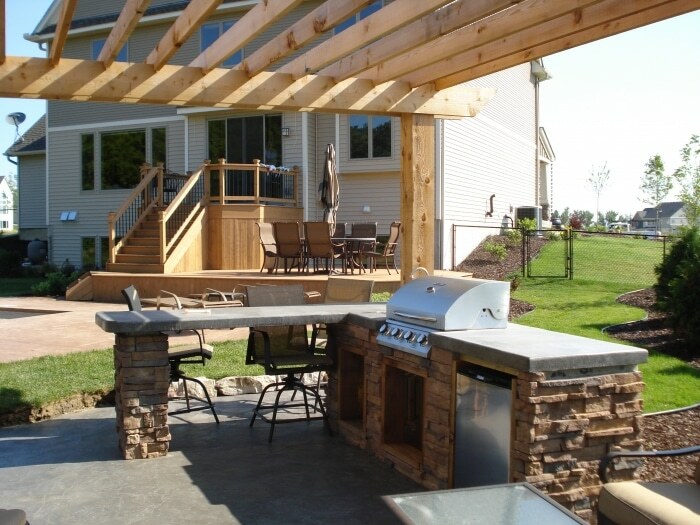 Why not give your Minnesota home more heart in essence by adding an outdoor kitchen and BBQ? The location of your outdoor kitchen and BBQ is important in regards to aesthetics, functionality and the features you already have in your backyard. Your custom outdoor kitchen could be integrated with an existing pool deck, patio area, gazebo, a standard backyard and more. Another consideration for the location of your outdoor kitchen and BBQ is the location of your home’s water and drainage system. Your design team and project manager at Innovative Building and Design will work with you to choose the most aesthetically pleasing location to you and preserve full-service kitchen functionality. Choosing the right appliances is important and one of the more exciting phases of building your dream outdoor kitchen and BBQ. Your options for choosing appliances, location and design are practically endless. We also offer interlocking pavers, brick and stamped concrete in all sizes, shapes and colors. The flooring you choose for your outdoor kitchen and BBQ should agree with the design, layout and overall aesthetics while delivering the functionality you need. Innovative Building and Design has installed many flooring materials that are not porous or slippery, keeping in line with the purpose of cooking in this area. Some great options to consider for flooring are river rock, flagstones, cobblestones, paver stones, pavers and naturally jagged stones. We at Innovative Building and Design want you to enjoy your outdoor kitchen and BBQ to the fullest for years to come. We can help you choose outdoor accents and features to make your outdoor living space more functional and breathtaking. Whether you want an outdoor kitchen and BBQ space fit for a gourmet chef or some down-home fun with family and friends, contact the professionals at Innovative Building and Design to make it happen!